"I received this recipe from an old Southern cook, a copy of a copy of a typed-up sheet from long ago, annotated with her notes (which included the word oleo instead of margarine). I've never seen another chocolate cake recipe like it, which instructs the cook to heat part of the cake batter on the stove, and pour the cooked icing over a hot cake. The result is a wonderfully rich (yet surprisingly light) chocolate sheet cake topped with a cooked chocolate and pecan frosting. This cake has an incredible homemade taste, yet is foolproof! Will make you forget Duncan Hines®!" Preheat oven to 350 degrees F (175 degrees C). Grease bottom and sides of a 9x13-inch pan. Mix 2 cups white sugar, flour, and salt in a mixing bowl. Combine water, vegetable shortening, margarine, and 3 tablespoons cocoa powder in a saucepan. Bring mixture to a boil over medium heat, stirring frequently. Pour liquid into flour mixture and stir well. Return saucepan to stove and set it aside. Dissolve baking soda in buttermilk in a large liquid measuring cup and stir in eggs and vanilla extract. Pour egg mixture into cake batter and mix until fully combined. Transfer batter into the prepared pan. Bake the cake in preheated oven until cake springs back when touched lightly with a finger or a tester comes out clean, 25 to 30 minutes. While cake is baking, prepare icing using reserved saucepan. Combine confectioners' sugar, 3 tablespoons cocoa powder, butter, milk, vanilla, and pecans in saucepan. Cook and stir over medium heat until hot but not boiling. Pour icing over hot cake immediately after it comes out of the oven. Allow cake to cool completely on a wire rack. This rich, authentic cake is dense with chocolate, coconut, and nuts. 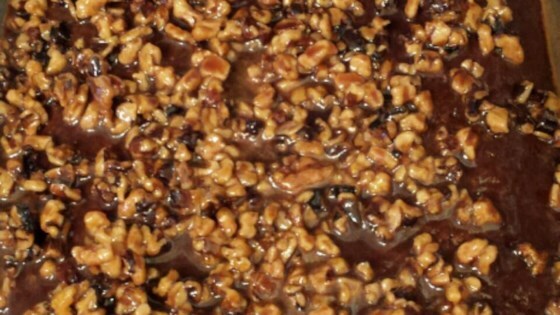 You may substitute walnuts for the pecans, if you prefer.